I know I’ve mentioned before how much I like reading restaurant menus. Have I ever gone on about my love for grocery shopping? I like the direct satisfaction it provides: find item in store, put item in cart, mark item off list. But I also keep an eye out for anything on the shelves that looks unfamiliar. Scouting out new products adds another whole layer of fun to my shopping trip. Let’s start with dessert first, shall we? I normally don’t keep ice cream (dairy or otherwise) in the house; it’s too easy to be tempted. So I save it for a treat only consumed at the ice cream store. Our local spot, Mallard Ice Cream, has some fantastic non-dairy choices which are my gold standard for comparison. But in case you want to stock your freezer with some yummy treats, So Delicious has got you covered. They already had ice cream alternatives made out of coconut, soy, and almond milk but they recently added cashew milk frozen desserts. I had been reading about them on other blogs and had been anxiously awaiting their arrival at my Fred Meyer store. I think they hit it out of the park. 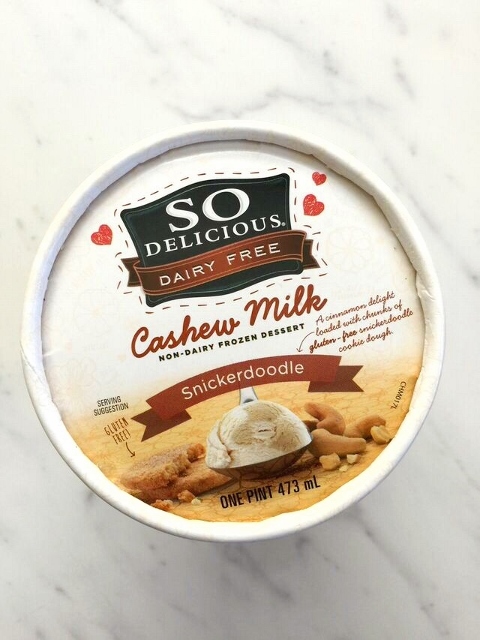 The creamy-crunchy balls of snickerdoodle dough nestled in the ice cream were what convinced me. But if for some unexplainable reason you don’t like creamy-crunchy balls of snickerdoodle dough nestled in ice cream, there are several other flavors to experiment with. My morning isn’t complete without tea. 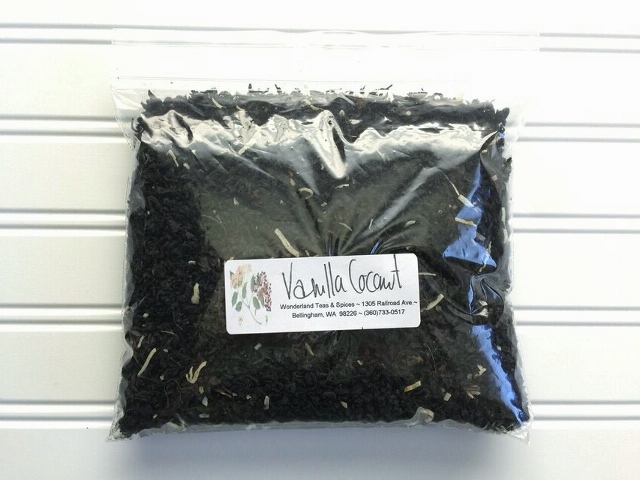 Normally my habit has been the green variety, but a friend recently brought me some vanilla coconut black tea from a local tea shop, Wonderland Herbs, Teas and Spices, and there’s been a pretty serious shift. Now, my green tea is just a memory…relegated to the back of the tea shelf in the pantry…at least for now. I have a new habit and it smells divine. Remember all the hullabaloo about bisphenol a (BPA) in plastic baby bottles? Well it’s in some can linings too. I regularly recommend canned foods to help people make dinner in a hurry and to encourage vegetable and fruit consumption year-round. And my plant-based household is a huge consumer of canned beans, so this is awfully disappointing news. I must admit that I don’t really know how to reconcile this problem (aside from home canning my own beans). But I do know I like alternatives. And I like to support companies that are trying to do things a better way. Pomì, for example, has already started selling their tomato products in aseptic packaging instead of cans. 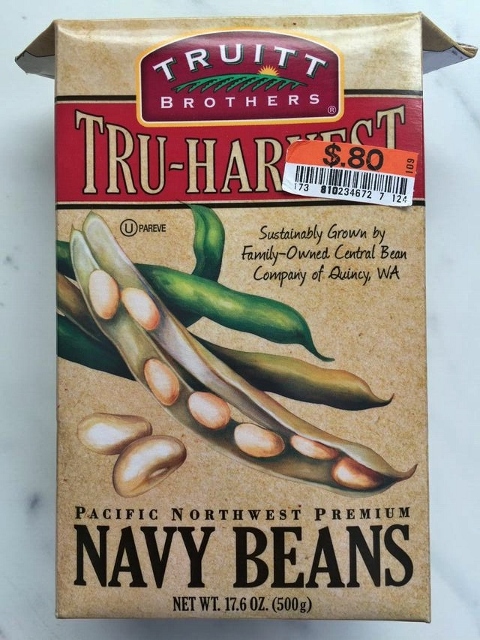 So imagine my happiness upon finding uncanned beans at Big Lots recently: shelf-stable boxes of beans! Just kind of neat packaging, don’t you think? And for me they’re even local, from a farm in Washington state. I’m not sure if this brand is widely available, but keep your eye on your grocery shelves for other companies doing the same thing. So Delicious made the list twice, completely by accident. Or because I really like dessert. I feel sure I’ve shared that confession on the blog before. However, I’m not sure if I’ve been brave enough to broach the topic of my love of Cool Whip. It’s a very favorite food from my childhood, but as a dietitian I try to limit it to once a year or so. As an alternative, I’ve tried the Truwhip, but for some reason I always get a strange metallic aftertaste. 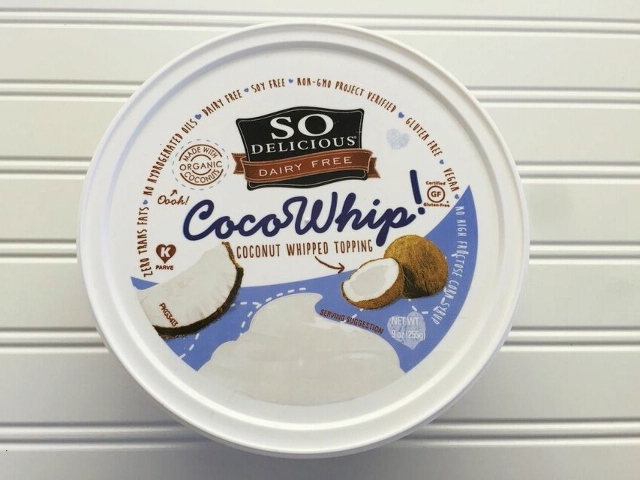 Not so with the So Delicious version: cool, creamy, sweet, nostalgic perfection in a tub. It’s primarily water, coconut oil, and tapioca syrup. So it’s certainly not a health food, and definitely not a food you should try to include more often in your diet. But I’d say it’s a nice alternative to my childhood treat since it has some organic ingredients but no hydrogenated oils or high fructose corn syrup. It’s also vegan, non-GMO, and gluten-free. Go ahead. Enjoy a dollop. Dare I say twice a year? 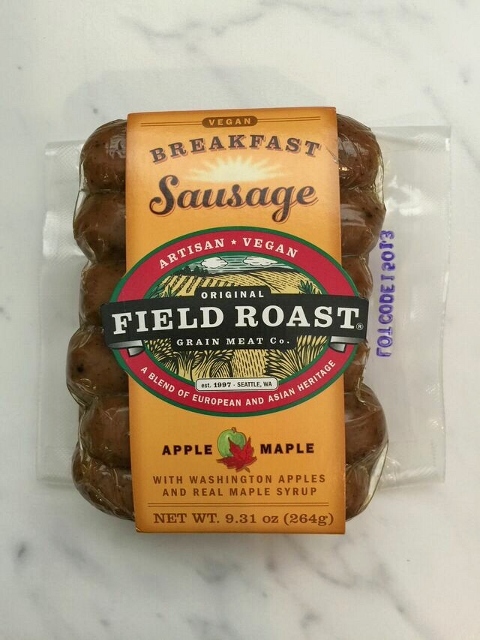 I already have a favorite meatless breakfast sausage. I wasn’t in the market for another. But because of my affection for Field Roast’s (large) Smoked Apple Sage Sausage Links, these new little tikes caught my eye at the Co-op. As expected, I was not disappointed. The flavor and texture of this wheat gluten-based meat substitute add up to salty and smoky wonderfulness. I received this super neato item for free. It was part of the swag we were given as attendees at a special Sur La Table event that was scheduled in association with the IFBC Conference. To be clear, I received a lot of swag. Bags and bags of swag. And besides this list of 10 favorites from the conference, I haven’t shared any other items with you. This one is worth talking about. Like you, we have limited counter space in the kitchen. Appliances that stay out permanently are the blender, toaster oven, and coffee maker. And now, our Aquasana. It has a pitcher and a dispenser, so you can just walk up and fill your cup or take the pitcher to the table. We could refrigerate the pitcher but we don’t. We seem to be A-OK with room temperature water. What else is cool? 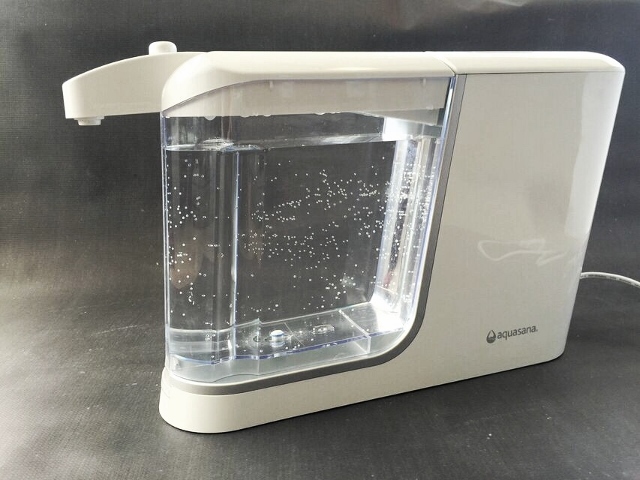 We’ve been using the Aquasana daily since October, and we still haven’t had to replace a filter. Jeff uses it every day just like me, so I asked for his feedback. The lids are designed to make filling easy. It’s slim, so it takes up less counter space. Or at least it seems like it does. The water tastes really good. Obviously, if we didn’t find it convenient enough, we wouldn’t use it. So let me tell you it has replaced our undersink filter exclusively. Do you not love this packaging? This wonderful item wasn’t actually at the store; it came in the mail. 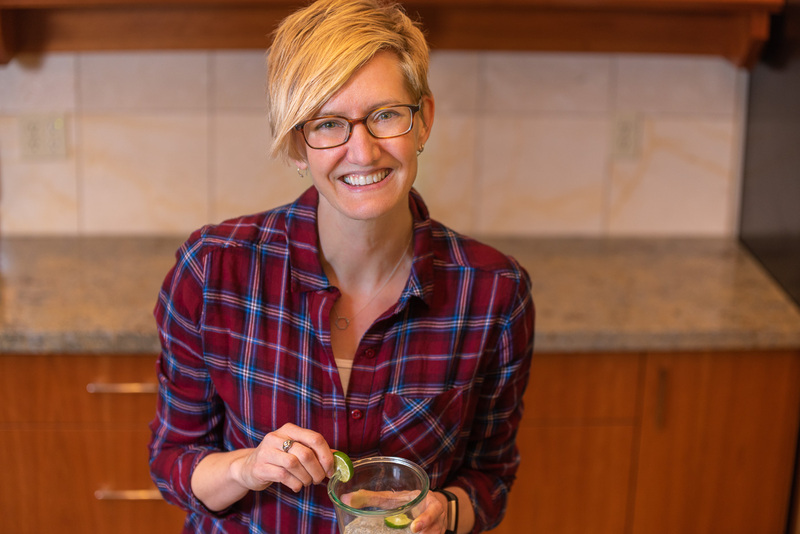 Jennifer from Driftaway Coffee reached out to me via email to see if I’d like to sample their product after seeing a recipe of mine that uses coffee: Iced Coffee Tea. I must say, even though my blog has a pretty small readership, I get pitches from companies or PR folks asking if I’d be willing to try a product and then write about it on the blog. If it’s not a good fit at all (i.e. spirulina capsules), I politely decline. If it seems interesting, I typically respond the same way: go ahead and send it, but I make no promises that it will end up on the blog. Jennifer’s email really stood out. She was personable and funny, and had actually read my blog. She was suggesting a food I already use. So it was easy to say “yes!” And here it is ending up on the blog. What’s cool about this company is that they send you 4 samples of coffee, ranging from fruity or classic to balanced or bold. 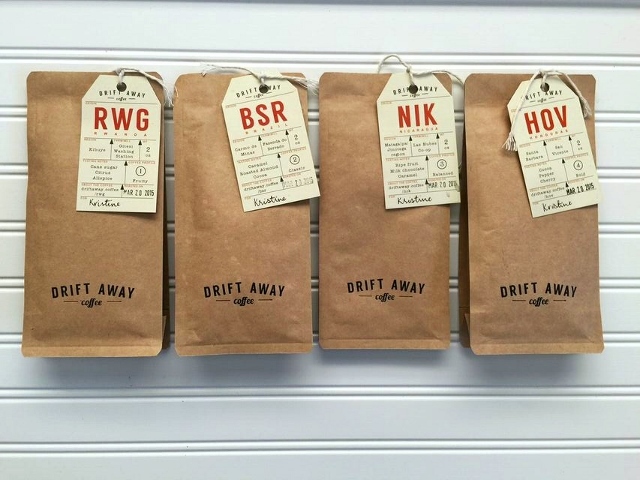 You sample each, share your feedback on their site, and then get personalized coffee sent your way when you place an order. Jeff and I had fun brewing up each one, pretending to be serious tasters, and trying to find words to describe the bitterness, roundness, and notes of cherry like a couple of dorks. My favorite was #3 (balanced) and I’ve since used it to make my Iced Coffee Tea several times. I couldn’t be more pleased. What do you say we also finish with dessert? Two desserts in fact, from one marvelous location. Icing on the Cake is a local (Bellingham) bakery that I’ve recently discovered is very vegan friendly. I found out about their Live Sweet Chocolates Vegan Salted Caramels from another local blogger, Vegan in Bellingham. Rest assured they are rich, creamy, chewy, and salty-sweet just like “regular” caramels, only made with coconut milk. 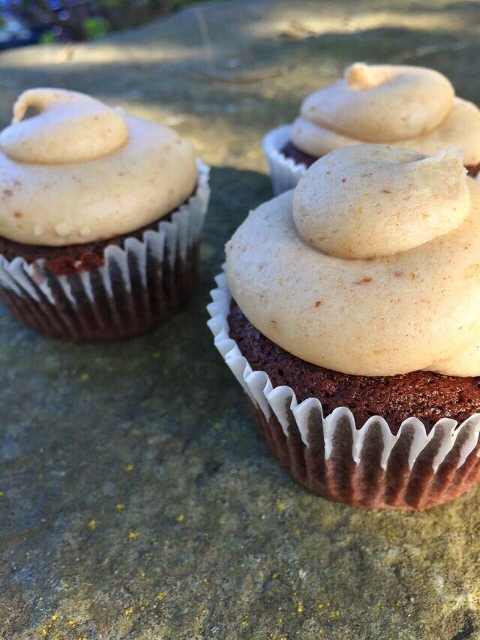 When I stopped by the store the owner mentioned that she makes vegan cupcakes as well, by request. I returned a couple of days later to pick up 3 chocolate cupcakes topped with frosting made from Earth Balance and dates (and some sugar I think). I must say, as a cake connoisseur I did not have high hopes for date-sweetened frosting. Boy oh boy was I wrong. I mean come on. I’m pretty sure non-vegans would eat this. The cake had a great chocolate flavor, and the dates were definitely not overpowering in the frosting. 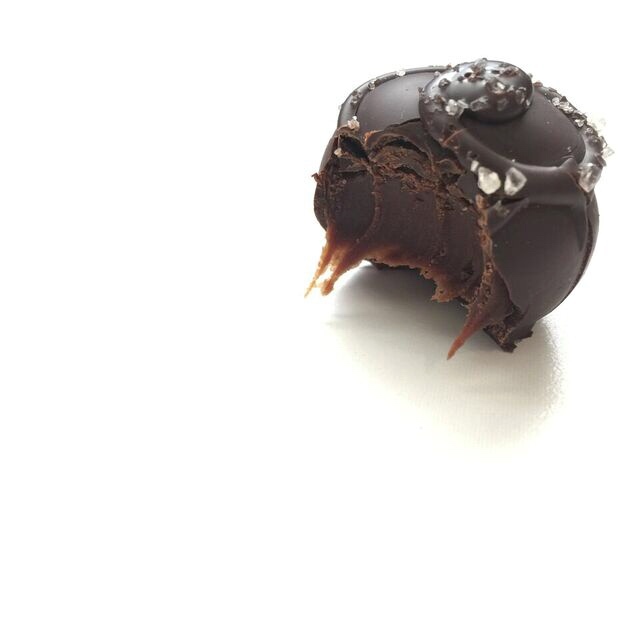 It was sweet and smooth with almost a mild brown sugar or maple taste that was really perfect with the chocolate. So impressed. Clearly I like to shop and eat, probably because more shopping leads to more eating. And I really feel like these particular products are worth raving about. If you give one of them a try I’d love to hear your thoughts. And not just on the dessert ones. Do you have any new favorite food finds to share? What’s been making your mouth happy these past few months? 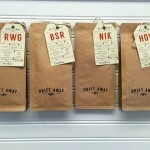 Disclaimer: As noted above, I received the Driftaway Coffee and Aquasana filter free of charge from the companies. I happily paid for everything else myself.